The Málaga Ferris Wheel – also known as the Noria Mirador Princess – is a 230 foot (70m) high observation wheel located in Málaga port, near the city center. 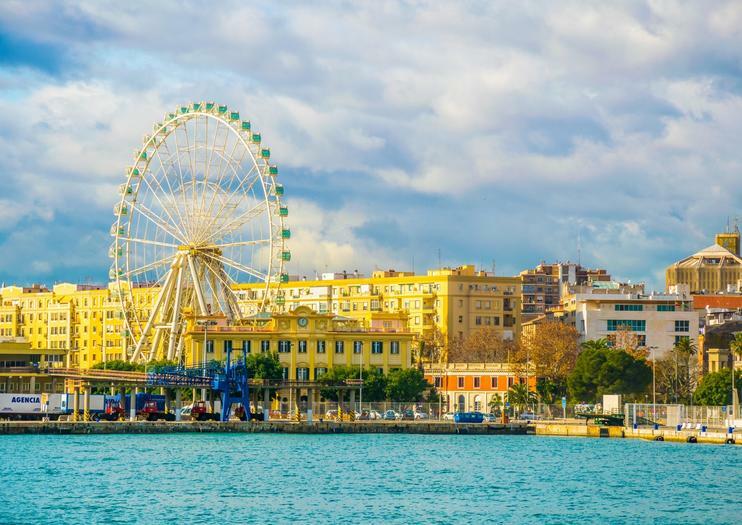 The ferris wheel offers unparalleled views over the port area, the buildings in the Plaza de la Marina, and all the way to the Málaga Cathedral and the castle of Gibralfaro. In fact, when visibility conditions are good, riders can enjoy panoramic views of almost 20 miles (30km) on all sides. A ride on the ferris wheel is 15 minutes long, during which time the cabins rotate three times. The wheel has 42 air-conditioned cabins, each of which holds eight passengers — meaning more than 1300 passengers can ride the wheel each hour. In practice, families, groups, friends, and couples will often have a cabin to themselves. In the evening, the sun shines on the cabins at the top of the wheel, while those at ground level are in the shadow of the city-center buildings. At night the wheel is lit up with 20,000 LED light bulbs. Insider’s Tip: You can get one of the best selfies in Málaga from the top of the wheel! A trip on the Málaga Ferris Wheel takes approximately 15 minutes, during which time the wheel makes three full turns. Each of its 42 glazed cabins accommodates 8 passengers and is equipped with air conditioning and LED lighting. The ferris wheel also offers access for people with disabilities. Eating, drinking and smoking are not allowed in the cabins. A safe area is provided for the storage of children's strollers, wheelchairs, and bicycles during the ride. We connect you with Malaga!Visit, explore, discover this cosmopolitan city in a Twizy, electric car, that will help you with your audio guide with GPS. You will know where you are and where to go.But yes, at your pace. Stand where you want (parking and "zona azul" are free for you) and delights with its corners that otherwise would stop visiting: neighborhoods, viewpoints, beaches ... you will have unique pictures.AUDIO Multilingual GPS guide explains the points of interest in your path when you travel the selected route.Enjoy, look and let them look at you. Your Twizy will attract attention. Are you ready?This 100x100 electric car with 0% emissions with 2 seats is easy to drive and park.